CCL’s main objective was to design bespoke bridge bearings to fit within restricted spatial requirements, as well as meeting a tight delivery schedule. 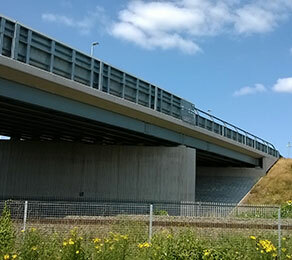 The project involved the construction of a road bridge over a mainline railway, allowing a newly constructed residential area to be connected with Bridgwater via Bristol Road. CCL designed and manufactured bespoke bearings to fit within the tight space and which can be adapted to changing design requirements. The companys manufacturing schedule was specially adapted in order to meet the short delivery timescales which the project required. Bearings supplied included several different free sliding, guided and fixed pot bearings. A particularly challenging element was designing uplift bearings which allow free movement and can withstand forces of around 400kN both downwards and upwards. CCL also made adaptations to paint specifications to meet the clients’ exact requirements. To ensure the bearings were operating correctly, CCL was recently commissioned to carry out a full inspection survey in February 2016.